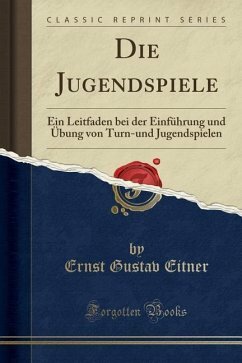 Excerpt from Die Jugendspiele: Ein Leitfaden bei der Einführung und Übung von Turn-und Jugendspielen Seit unh Gelegenheit finh iiberhieß gunftig. Überall hringt haß %erftänhniß fiir hen fiihrt unh hie $eheutung her 6ache in immer weitere Rreife; überall regt fich in hen 38eftrebungen ein gelner, wie gan3er Römerfrhaften unh ?bereine ein beachtenßwerter Qßetteifer, an hiefem 98erle mitguarbeiten, unh mancheä ftähtifche (snneinwefen bringt namhafte Dpfer, um ihrer 8ugenh hen lange oergeffenen @pielpla3 wieher au eroffnen. About the Publisher Forgotten Books publishes hundreds of thousands of rare and classic books. Find more at www.forgottenbooks.com This book is a reproduction of an important historical work. Forgotten Books uses state-of-the-art technology to digitally reconstruct the work, preserving the original format whilst repairing imperfections present in the aged copy. In rare cases, an imperfection in the original, such as a blemish or missing page, may be replicated in our edition. We do, however, repair the vast majority of imperfections successfully; any imperfections that remain are intentionally left to preserve the state of such historical works.